Author’s note: I recently took a journey, a last sojourn, through Chicago’s tech scene. I’m leaving, and I wanted to give the place that has been my welcome host for four years a proper exit. This post and a few others are my goodbye to the city. It’s been great. In Februray, TNW wrote a piece detailing a future technology space in Chicago that would change the landscape of the city’s startup scene, if it met all its stated goals. Clocking in at 50,000 square feet, 1871, the space we covered, is now up and running, and I can report that from the visitor’s perspective, all its promises have been met. 1871 is a blend of working space, reserved desks, small branch offices for local venture capitalists, the Excelerate incubator program, and Code Academy, which has its two classrooms on site. Like I said, it’s huge. Some people have Razor scooters that they use inside to save time zipping around. The space also has a location for events that could hold, I’m guesstimating, about 200 people without stress. There’s a coffee shop as well. Thus, from a first cheap shared spot at a desk, all the way through a startup’s young life, 1871 is a place that they could call home. Now, I don’t think that 1871 wants mature companies to rent up a huge block of the reserved desks, and conquer a large patch of that section of the floorplan, so there will be a sort of flow, through 1871, as companies grow up and move out. However, for a fresh firm, it’s an interesting opportunity. The access that is built-in to capital, and general knowledge is great. It’s not as intimate as Catapult, which I recently wrote about, but it’s also more inclusive in terms of who can get space, so, it’s simply a different stroke. Now, to some nuts and bolts. 1871 was the vision of Mat Moog, the CEO of Viewpoints, and inveterate fixture in the Chicago tech scene. 1871 is managed by the Chicagoland Entrepreneurial Center. There are three levels of membership, ranging from $125 a month, to $400. All levels have access to conference rooms and the like. Partners of the space include various local universities (The University of Chicago, Kellogg Business School, etc.) and the Illinois Science and Technology Coalition. The larger question that needs to be asked is what sort of impact 1871 will have on the Chicago technology scene. It’s interesting to note how quickly 1871 has filled; if there isn’t a waiting list currently in effect for membership, I fully expect there to be one shortly. The place was hopping during my visit. Which says quite a bit, I think, about how far Chicago has come. 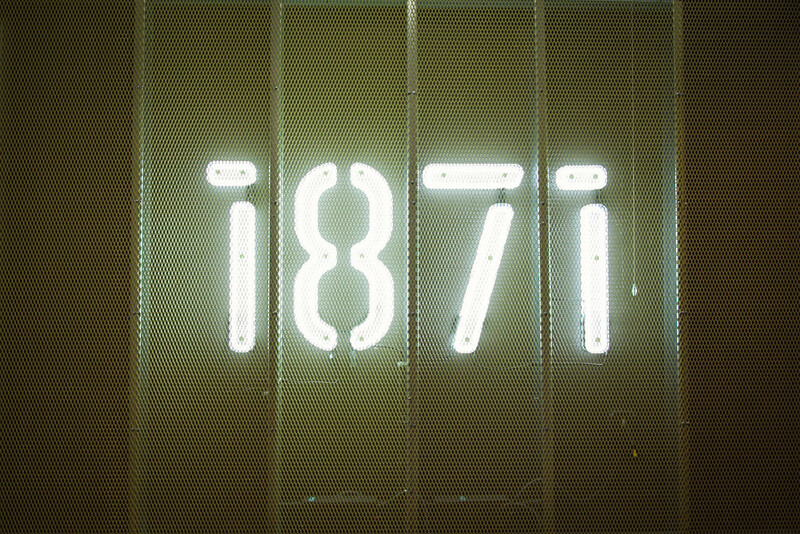 1871 is an impressive installation, and one that was (assumedly) very expensive to put together. That means there’s enough human and monetary capital splashing around here in the Second City that an 1871 can pop into existence. However, that only means a certain level has been reached. What comes next, is the better question. Essentially, I expect that 1871 will act as both hub, and accelerant. Given its central location, geographically, in the city, and size, it will likely become the most common place to hold smaller technology events, and of course, in-person meetings. Also, by bringing together so many pieces of what constitutes a tech scene – capital, entrepreneurs, and incubator, and via Code Academy, a stream of fresh development talent – it will provide a coalescence that will yield more teams, more quickly, I think. That means a more active technology scene, and a healthier Chicago. Of course, 1871 will operate best when all pieces that currently constitute it are in place. If one part of the nation’s startup ecosystem dries up, say venture capital, the space will lose some its vitality; it could hollow out over time if things slow down. But if it does its job, the chances of that happening, at least locally, should be diminished. It will be interesting to see how the culture of 1871 changes over the next year, as it matures from infancy, in its newness, to more of an institution. I’ll close by saying that if I was building a company in Chicago, and wasn’t moving to San Francisco, I would seriously consider taking up space in 1871. If the tragedy of the commons will eventually wear the place down is yet to be seen, but for now, Chicago has a new pillar.